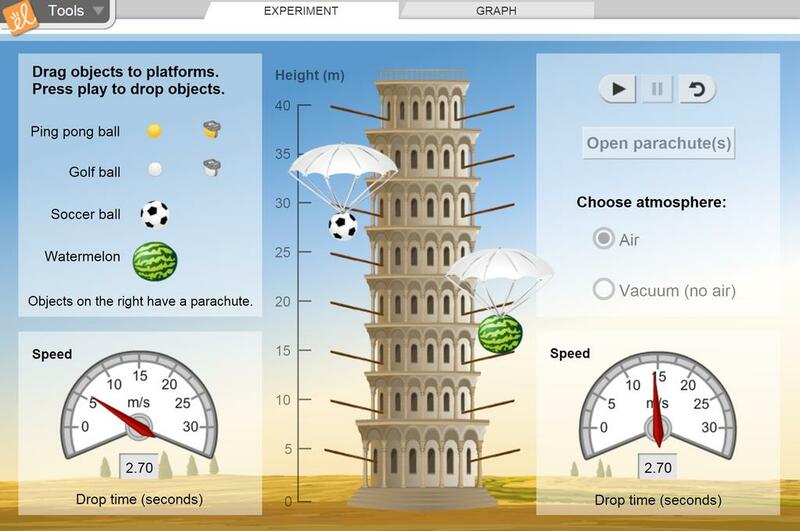 Recreate Galileo's famous experiment by dropping objects off the Tower of Pisa. You can drop ping pong balls, golf balls, soccer balls or watermelons. Objects can be dropped in air or no air, with or without a parachute. The speed of each object is shown on a speedometer and a graph. Compare how quickly different objects fall in air. Discover that in a vacuum, all objects fall at the same rate. Observe that objects accelerate as they fall. Interpret a graph of speed vs. time. Explore and compare the effects of air resistance on each test object. Find the terminal velocity of objects falling through air, with or without a parachute. I used this to prove to my skeptics about acceleration due to gravity. Loved it for alternative students. This is a great Gizmo for both science and math concepts from elementary through high school.